A new simple classification modeling procedure, multi-wavelength statistical discriminant analysis (MW-SDA), is proposed for the identification of Shandong green tea origins coupled with near-infrared (NIR) spectroscopy. 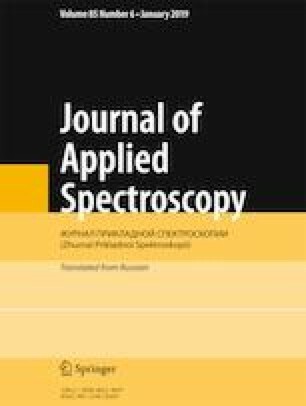 After smoothing and first derivative preprocessing, seven characteristic wavelengths (CW) were selected by enlarging the detailed information of preprocessed spectra. Then, for each characteristic wavelength, a classification threshold is calculated according to the differences in absorbance value, which can best separate the spectra for different origins. Based on the seven CWs and corresponding thresholds, seven classifiers were obtained, which form the classification model. The performance of the calibration model was evaluated according to sensitivity, specificity, and classification accuracy. Analysis results indicated that MW-SDA can be used well to build classification models. The predicted precision of the last model in prediction set was: sensitivity = 1, specificity = 0.967, and accuracy = 98.3%. Published in Zhurnal Prikladnoi Spektroskopii, Vol. 86, No. 1, pp. 89–95, January–February, 2019.